We all know people who, after the sudden and bitter end of a seemingly loving relationship, say, "Well, I guess it wasn't love after all." Perhaps we've said this ourselves on certain occasions. In either case we must also know, too, the cruelty of that lie, of that attempt to say that a thing can only be one way or another. Of course every bad or somehow wrong relationship in which there is love to be found is, in a way, an instance of love, even if, from the distance afforded by time, it seems that it must have been otherwise. These are what so many of our memories are, after all: recreations we know are false but we find we can live reasonably happily in, anyway. All the most beloved experimental writers of the past century have shared a common goal: to return art to the praxis of life. What this means is that so much of what we now deem experimental is an attempt to make the artificial seem perfectly authentic and even organic. Certainly there have been periods in which artifice has been quite publicly celebrated in and for itself -- glam-rock comes to mind -- but the most abiding adventures in art these last ten decades have been those that marry their studied excursions into theory or other abstracted playgrounds with a sense that they do, finally, enrich or enliven or in some interesting way unfold what it means to be human. This is one reason that the most elementary forms of irony have never in contemporary times been considered particularly innovative; they studiously distance art from life so as to insert within that abscess some critique that is easily ignored because it doesn't, in fact, happen in the same space any of us actually live. Metaphor-laden poetry has become tiresome or even irrelevant to a vast swath of us for the very same reason. The problem I've had -- that many I know have had -- with experimental writing in the postmodern era is that it is deconstructive. What it shows us is only that things cannot and do not hang together over time; that we ourselves are contingent creations living in spaces that are always in the process of being compromised because they, too, are contingent. Deconstruction is thrilling because it gives the artist a sense of having exposed something, and her audience the feeling of having entered a pedagogical space in which something previously hidden is now open to view. But what we find, over time, is that having hidden things revealed to us over and over again by art finally has only the effect of reminding us that life is a many-chambered shell deliberately foreclosed to us by unseen forces. It reminds us, too, that the intentions and perceptions of other people are by and large hidden from us in -- the real torture -- plain sight. I see you looking at me and I wonder what you think, and I call that wonder mystery; I walk through the world every day experiencing that sensation again and again and I soon find myself calling it agony instead. Postmodern art addresses us, then, the more we steep ourselves in it -- and this is no more true than for the artists themselves -- to the structural agonies of the universe. To badly paraphrase the first working "metamodernist", David Foster Wallace, if you fake throwing a ball in a game of fetch with your dog enough times, eventually when you actually throw the ball the dog just stares at your finger and the game necessarily ends. Cynical subjectivities, palimpsestic ironies, deconstructive framings, the jailbreak of iterability, so much fragmentation, cries of unavoidable degradation -- these hallmarks of the postmodern no longer gesture at anything; the gesture itself has, for a great many of us, swallowed whatever it was that was worth looking at (or for) in the first place. The result is an existential despair no one can healthily live in for long. But there is something more dangerous to the spirit than postmodern art, and that's whatever it is our media has started to do with alarming frequency ever since wall-to-wall news coverage left media corporations with too little content to fill the air-time they'd chartered for themselves. What our media does is create master narratives that are deliberately flawed -- sometimes even using these narratives to encourage men and women to create, in real time, their own flawed master narratives -- so that pundits can alternately appear intelligent by pointing out how the narrative they themselves constructed is coming to pass, or bewildered at the failure of their artificial narrative and therefore in our eyes like tragic actors in a play we would naturally (because of its clownish dramatic ironies) wish to watch. It's a win-win scenario for a corporate enterprise: if you draft a master narrative that has Jeb Bush winning the Republican nomination, as the national media did, you can either appear prescient when he gets the nomination (which cements the ethos of your enterprise and all associated with it) or confused when your narrative is turned aside (which cements your audience in their seats, as no one can resist the temptation of others' public confusion). In the 2016 election, we can all see that the media has tried to seize a rare opportunity to have it both ways: a "surprising" master narrative on the Republican side of the equation -- Trump -- and the playing out of a long-anticipated, ethos-building master narrative on the Democratic side, that being the inevitability of a second Clinton becoming the Democratic nominee for President. What is left unsaid here is that master narratives are, of course, nonsense. They're nonsense because every event is a confluence of many seen and unseen narratives; they're nonsense because the act of observing an event does, as physicists well know, change that event in unpredictable ways (cf. universal wavelength function); and they're nonsense for a third reason active metamodernists are unusually attuned to -- because even when and as individual narratives unite to create the appearance of a master narrative (a metanarrative), there are always, at the very same time and in the very same space, other individual narratives uniting into other, indeed nearly an infinite number of other discrete metanarratives just as credible. We may not experience time in the fifth and sixth dimensions, in other words, but both those dimensions exist whether we inhabit them or not. The only question is whether literary art in the form of so-called "professional writing" can reproduce, in real time, at least the sensation of inhabiting these higher dimensions. Metamodernists do not deconstruct; they encounter deconstructed landscapes and atop them aim to reconstruct the many overlapping possibilities those landscapes now obscure. Metamodernism is not cynical, or ironic, and it certainly has no interest whatsoever in deceit; it earnestly seeks to expand our sense of the possible by noting that multiple master narratives or metanarratives can co-exist in the same space. (Note that this is significantly more radical than saying many narratives can co-exist at once; that's something all of us instinctively and from hard experience already know to be true.) While this might tend to destabilize corporate master narratives, and while it might also tend to unsettle individuals' guiding metanarratives, the aim of metamodern literature is not to expose how things can be unsettled or fractured but rather the opposite: how fiction and truth, creativity and analysis, optimism and cynicism, sincerity and irony, deconstruction and reconstruction -- Art and Life -- can be said to be and thereby can be seen as eternally juxtaposed and ineluctable. In other words, open up the possible and you find the impossible inside; raise up the impossible to the level of the possible and eventually it becomes as possible as everything else and sometimes even more so. I've been a metamodernist creative writer for many years now, but had not seen an opportunity to bring this earnest, optimistic, and loving art practice into my professional writing activities until Bernie Sanders came along. Not only do I fully support and endorse Senator Sanders' agenda, I see in his political methodology evidence of the metamodern, just as I know for certain when I hear Clinton's cynical incrementalism that I am in the presence of a postmodern political ethos. The reason we think of Bernie Sanders as impractical or even naive is that he is; what most fail to see, however, is that his is the "informed naivete" of metamodernism. He sees that our economic and cultural markets are in a terminal state of deconstruction, and yes, this makes him angry and "negative" in a certain respect, but he sees too that the opportunity this deconstruction affords us all is a moment in which we can reconstruct everything we've known in a way that better reflects our values. Draw up blueprints for the impossible and you find, in time, that individual pieces of an impossible plan become first improbable and then merely unlikely and then even odds and finally, at long last, possible. Repeat that procedure enough times and universal wavelength function tells us that the very fabric of reality can be altered. In simpler terms, when Bernie Sanders tells Hillary Clinton that universal healthcare, universal higher education, and a living minimum wage are human rights, she may not realize it but that's the end of the consequential part of the conversation. The long-term details of how these things are achieved pale in significance to the far grander and more audacious act of naming the impossible as possible in the first instance. Clinton demanding that Sanders compare his policies with hers as to these topics is so beside the point as to make the Secretary seem foolish; if I tell you I have the power to fly and in time will find a way to manifest that power to you in real time, your first response isn't to ask whether I agree that all proposed flight plans should be pre-cleared with the FAA. Bernie Sanders' "political revolution" is political only inasmuch as thought is political. What he is really asking us to do -- or, rather, because he knows how many Americans grew up with postmodernism as their mother's milk, what he is asking young people not so jaded to do -- is participate in a metamodern Enlightenment that is, at base, a philosophical revolution. What he is saying is that, yes, a $15-an-hour minimum wage is absolutely impossible at the federal level right now, but if enough people adjust their perception at the local level to briefly imagine this impossibility as a possibility, suddenly Seattle can pass a $15-an-hour minimum wage. Then Los Angeles and San Francisco. Then New York City and D.C. Then smaller towns -- perhaps a town like the one in Ohio that just passed, effective forthwith, six months' paid maternity and paternity leave for all municipal employees. That's an idea that has no place whatsoever here in America -- that is totally foreign to the intellectual infrastructure we've developed -- but when you find fertile soil for the impossible it really doesn't matter how large a plot of land you're working with. By the very nature of things -- we might call it perceptual entropy -- the impossible, once perceived, enters a chain of causation whose natural conclusion is realization. It's hard to believe that no one's noticed yet that Sanders' entire political agenda is a thought experiment -- an instance of long-term ideation rather than immediate satisfaction. The idea that Sanders supporters will all, en masse, blindly vote for Hillary Clinton in the fall, or that Sanders attracting more than 40 percent of all Democratic hearts and minds means anything other than that the Democratic Party is about to fracture, is based on the fallacy that Sanders and Clinton represent political philosophies whose differences are in degree rather than in kind. In fact, when and as Sanders chooses not to lay out a policy in furtherance of an ambition; when and as he does offer a policy, but its implementation is murky; when and as he chooses to inspire emotion rather than a model UN-like legislative plan, it is because he sees that Washington is broken and knows that the only national politician worth a damn in that scenario is one who shows us each individually how we can act locally (not, or not yet, nationally) to reimagine the possible. Sanders' much-maligned answer before a newspaper board as to how he might negotiate with Mitch McConnell over a disagreed-upon policy initiative -- that he would tell Mitch to look outside his window and see the tens of thousands of people standing there demanding he act -- is not the vision of a foolish old man or a political dunce. It is, in fact, the entirely predictable and logical conclusion of the very chain of events Sanders means to initiate with his candidacy. After all, once $15-an-hour minimum wages exist in hundreds and hundreds of American towns and cities the notion of a $15 federal minimum wage will indeed be standing outside Mitch's window, metaphorically speaking. Those "people" Sanders refers to are towns and cities and states that have reimagined the possible and thereby in once-invisible increments changed the Real for the whole of us. When I began blogging about Bernie Sanders, my goal was to imagine what an equally accurate and reasonable and just master narrative sitting alongside the one promoted by the corporate media would look like. I wanted to write editorials that came from that master narrative, not the corporate one, because I believed then and believe still that the experimental journalism of the future will embrace the multi-dimensionality of metanarrative. Write that Sanders is in the midst of a competitive primary race enough times -- and support those claims with unimpeachable elements of the totalized "Real" -- and in time we collectively can see that that seemingly impossible metanarrative is every bit as powerful and present and perceivable as any other. Over the last 90 days, my articles on the 2016 Democratic primary have been shared more than 200,000 times on Facebook, and with each share there were people who read the article and called it a fantasy and others who saw in it a master narrative equally plausible to the one they've been sold daily since that moment in the 1990s when Hillary Clinton decided she would become President. My articles have been entirely factual and entirely accurate. They have also deduced from the range of the possible and impossible other metanarratives beyond those presently acceptable to mainstream journalists. For instance, the fact that Hillary Clinton beat Bernie Sanders in February early voting in Arizona by more than 30 points, but lost to Sanders 50 percent to 46.5 percent in live voting in Arizona in March, could be entirely explained by the demographics of the archetypal early voter -- as the mainstream media claimed, per usual seeking a binary approach to their own master narrative, one in which a given analysis either "fits" or is "fiction" -- or some part of that dramatic statistical disparity could be that Hillary Clinton wears on voters over time. That Clinton was leading Sanders in her home state by 42 points just a few weeks before the Illinois primary, and then only won there by less than two points, could be meaningless ("a win is a win") or an instance of a cognizable error in the metanarrative the corporate media has adopted ("the polling was off") or could, again, suggest that Clinton's strength as a candidate is ebbing both in individual states and overall. Or perhaps a combination of all three. So when I wrote that "Bernie Sanders Is Currently Winning the Democratic Primary Race, and I'll Prove It to You," I was offering a "minority report" of the Real: suggesting that something may actually have shifted in the Democratic race around March 15th. Illinois voted on that day, but so did North Carolina, a state thought to be unfriendly to Sanders which he somehow lost in only the mid-single digits in live voting, even as he was playing Clinton to essentially a tie in Missouri. Clinton's early voting lead of well over thirty points in Ohio disintegrated in live voting, where Clinton appears to have won in the high single-digits or very low double-digits. The mainstream media said only, of the March 15th primaries, "Clinton goes five-for-five." I saw in the same data another possibility entirely. Another metanarrative. And as an experimental writer I wanted to write of, from, and for that metanarrative rather than any other then available for public use. After I wrote my article, Sanders began winning the overwhelming majority of states. Clinton's unfavorables rose. Sanders continued getting massive crowds even though it'd become obvious that at least the pledged delegate math was absolutely dire. His general-election poll numbers against Donald Trump both nationally and state-by-state started to exceed those of Clinton with such a startling consistency that it's amazing the Clinton camp's all-too-simple "spring polling is meaningless" spin placated the corporate media into silence. The polls didn't fit their metanarrative, and as they had some -- albeit spotty and contradictory -- evidence suggesting spring polling isn't probative, they went with that explanation. And then they dropped that pretense the moment it seemed Clinton was the likely nominee and spring polling made for a good (and, more importantly, consistent-with-metanarrative) news story. And yet what they failed to realize was that Clinton and the DNC's (e.g. Howard Dean) view of super-delegates -- that it was all right for Clinton to accrue hundreds of them in 2015 because super-delegates don't cast their ballots based on the popular vote or the delegate count -- could in time be seen to undercut Clinton's narrative that, having failed to secure the 59 percent of pledged delegates needed to avoid recourse to the super-delegates, she should be given the nomination on July 25th anyway. And thus was the most surprising metanarrative of all born. The master narrative employed by the mainstream media since early 2015 has been that Clinton is destined to finally get what she deserves: a general-election shot at the White House. The media is so steeped in this version of the Real that the fact that something entirely different from this is happening this election cycle has escaped them entirely. The minority report for this election, which I began writing on the day Donald Trump announced his candidacy, and I wrote a blog post entitled "Trump Is Serious: Why the Donald's Presidential Campaign Is More Than Just Entertainment", says the following: this is the first metamodern political campaign, and not only have all the old rules of politics gone out the window, so too have all the old modes of thinking about the Real. The minority report for the 2016 presidential election says that we are in the midst of the end-times for the major political parties -- yes, both of them -- and that Sanders and Trump are the Angel and Devil (as it were) of the metamodern Garden of Eden whose lush overgrowth we now find ourselves surrounded by. I spent the fall writing about the Devil for Metamoderna -- Trump as a post-policy, post-truth, post-personality entity whose "angry optimism" so dynamically synchronizes with the mood of the nation that voting for it means voting for one's own self-contradictory macro-feelings more so than a candidate, making Trump in a certain sense unbeatable -- and I've now spent three months writing about the better angels of our newly metamodern nature. I'm thrilled to say that the latter writings, the ones about Bernie Sanders, have been infinitely more popular than the former. The old journalism is dead because the Real as it constructs it no longer coincides with the Real as Millennials either experience it or (far more importantly) can imagine it. It speaks only to and into the past; the language it speaks in is deconstructive, but on a landscape so already deconstructed that every word it pumps into the ether is another kick to a dead horse; it speaks from a form of power -- temporal, monetary, geopolitical -- that won't have currency in the decades to come. The chief currency today is of course virtual, and it's attention. Not the cynical breed of attention we associate with the vocal ministrations of a carnival barker -- though this is the future Trump would sell us if he could -- but the attention to multi-dimensional narrative that actually creates possibility from impossibility. And that's the only means of production Sanders is hoping his movement will come to control. Sandersism isn't dying out, and won't die out, because it is born not of so-last-century hash-taggable philosophies like #FeeltheMath or even the impotent rage of, say, #NeverHillary, but a commitment to turning the feeling that there are other realities out there than the ones we're being exposed to into a way of life and not just a slogan. 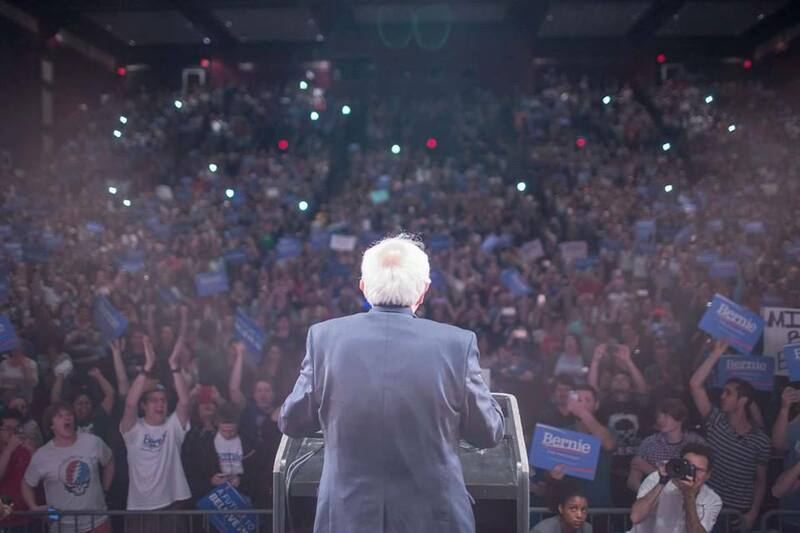 So #FeeltheBern has nothing, finally, to do with Bernie Sanders. What it means for the only generation that will matter in just a few short decades -- Generation Y, (though of course even the term itself is a monstrosity born of the now-fully-past) -- is that a journalism that simply instantiates the metanarrative of least resistance, and looks for whatever sequencing of phenomena would suggest the most synchronicity with the past (and present), is no longer palatable to the overwhelming majority of young people in this country. My present metanarrative for the 2016 presidential election is no more true or false, in the long-term, than the other ones now available, but it constructs something new rather than rehashing something old -- and therefore has a special power that will continue to cause consternation to major media institutions and social media trolls the nation over. I'm told the Clinton folks don't like it much, either. Why? Because Bernie Sanders has won this election, and Hillary Clinton is only a ghost silently mouthing out the final lines of a play we've all seen before and an ever-increasing number of us no longer feel much need to return to. What Sanders offers, instead, is not the empty and passing affections produced by insubstantial rhetoric, but a robust and abiding love of possibility that loves the possible enough to go searching hopefully and without expectation in the only place that will finally matter to our grandkids -- the wide-open, still-unwritten spaces that lie beyond it. Seth Abramson is an Assistant Professor of English at University of New Hampshire and the Series Editor for Best American Experimental Writing (Wesleyan University Press). He has been writing about metamodernism for a variety of publications, including Indiewire and Metamoderna, since 2014, and has been writing and publishing metamodern poetry since the summer of 2013. His most recent books of metamodern literary art are Metamericana and DATA, published by BlazeVOX.